The What: Epson has launched LightScene, which it describes as a new category of accent lighting laser projectors for digital art and signage, at DSE 2018. They will be on display from March 28-29 at booth 2336. The What Else: With two models available in a spotlight form factor—LightScene EV-100 in white and LightScene EV-105 in black—the laser projectors are designed to blend discreetly with surroundings and offer an array of configuration, mounting, and programming options. “Consumers crave memorable and engaging experiences,” said Remi Del Mar, senior product manager, Epson America. “Display technology is changing the way consumers interact with brands and products, from the ease at which they are able to receive information to the way they digest an abundance of content. The new LightScene laser projector category will provide solutions to businesses creating captivating, immersive environments to engage customers with their product or brand, without impacting the overall atmosphere. Both models feature 3LCD laser technology for up to 2,000 lumens of brightness and up to 20,000 hours of virtually maintenance-free operation, plus a sealed optical engine to help retain image quality and performance. Content management features include templates, effects, color filters, and customizable options; users can create playlists, control the projector, and schedule functions remotely with a web-based application or over the network with Crestron, Art-Net, and more. 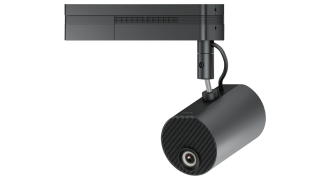 The projectors can be scaled for an array of applications; users can daisy chain multiple LightScene projectors and utilize edge blending for large displays, and they can be rotated vertically and horizontally with 360-degree mounting on tracks, floors, walls, or ceilings. 1.58-times powered optical zoom and powered focus allows for installation in both large and small spaces. Playlist and playback functions allow for improved content management for single or multiple LightScene projectors, and they feature a wide range of connectivity options, including HDMI, RJ45, wired and wireless LAN, and SD card slot for direct content storage when needed. Epson teamed up with designers from London, New York, and Tokyo to showcase examples of how LightScene brings retail and hospitality exhibitions to life. These examples will be showcased in Epson’s booth at DSE, along with ideas and design concepts from U.S. design agencies such as All of It Now. The Bottom Line: LightScene is designed to simultaneously illuminate and project content on virtually any surface or material to engage audiences and provide an immersive experience for commercial signage applications in markets such as retail, hospitality, showrooms, and museums. LightScene projectors will be available May for $2,499.